P.J. Gorneault (left) of Caribou and Judson Cake of Bar Harbor run side by side during Sunday's 35th Sugarloaf Marathon. Gorneault won the men's title for the second straight year. Leah Frost of Portland (right) smiles as she runs along Route 27 during Sunday's 35th Sugarloaf Marathon. Frost won the women's title for the second year in a row. 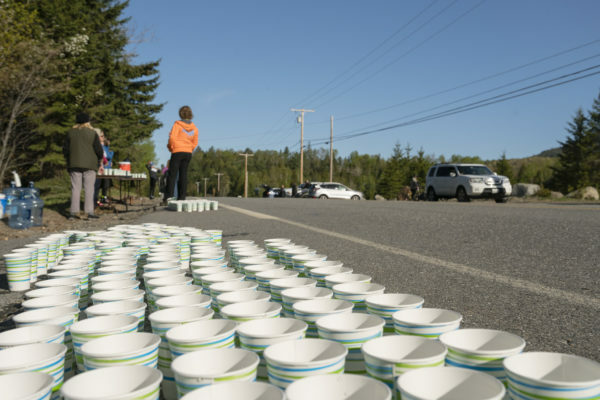 A volunteer at a water stop along the route of the Sugarloaf Marathon waits for runners to arrive during Sunday's race from Eustis to Kingfield. CARRABASSETT VALLEY, Maine — With cool temperatures and clear skies providing favorable conditions for runners, P.J. 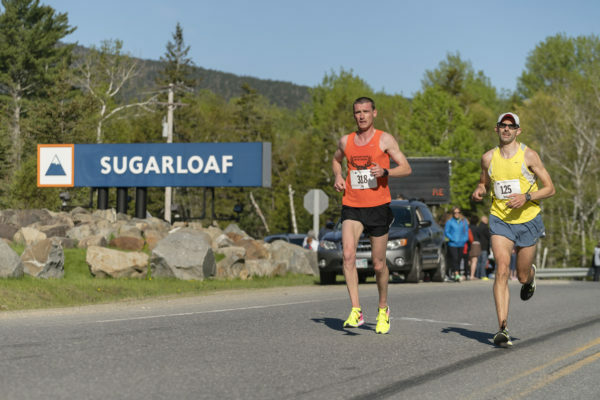 Gorneault of Caribou won his second straight title in the 35th Sugarloaf Marathon on Sunday. The 38 year-old crossed the finish line in 2 hours, 32 minutes, 7 seconds. Leah Frost of Portland also registered her second consecutive Sugarloaf victory as the 33-year-old won the women’s race with a time of 2:49:54. Both Frost and Gorneault completed the race nearly two minutes ahead of their winning times from 2016. Maine runners swept the men’s podium, as Judson Cake of Bar Harbor finished three minutes behind Gorneault with a time of 2:35:41. Robert Ashby of Brunswick, who won the race in 2015, claimed third in the men’s division at 2:40:44. Frost finished 10 minutes in front of women’s runner-up Jessica Van Binsbergen of Portland, who was clocked in 3:00:06. Rebecca Trachsel of Winchester, Massachusetts, placed third with a time of 3:00:16. Joan Benoit Samuelson of Freeport, the 1984 Olympic gold medalist, finished seventh in her first marathon in her home state with a time of 3:12:21. With 15 kilometers to go, Samuelson was joined by Maine running legend Michael Westphal of Great Cranberry Island, and the due crossed the finish line side by side. They raised more than $17,000 for the Michael J. Fox Foundation, which supports awareness and research for Parkinson’s Disease. Samuelson’s son Anders Samuelson dominated the men’s field in the 15-kilometer race with a time of 52:13 seconds, while Tamma Carelton of Berkeley, California, emerged as the women’s champion in 55:59. With competitors traveling from as far away as Guatemala, this year’s race was composed of 1,600 registered runners hailing from 41 states and 3 countries. Sponsored by Landry French Construction Company and Darling’s, the Sugarloaf Marathon is Maine’s oldest continuously run marathon. As an official qualifying race for the Boston Marathon certified by the United States Track and Field Association, the race is popular among running enthusiasts. One hundred percent of sponsor dollars from the marathon go to the Sugarloaf Region Charitable Trust, which is a private, non-profit trust dedicated to improving the quality of life for the communities that make up the Sugarloaf area. Last year’s event resulted in a donation of more than $10,000 for the trust. The top three men and women in each race received cash prizes, and all entrants received a t-shirt, a post-race breakfast, a massage, and a medal.